Do you have an attitude of gratitude? I do! This year presented me with a cornucopia of creative opportunities allowing me to bend, stretch and flex my artistic muscles in all sorts of ways. Periodically I mention a project or two in social media, no more than that as I wouldn’t want to bore family, friends, colleagues or clients. Some of you may know that over the summer I recorded a Text to Speech project in Scotland, a once-in-a-lifetime experience, details of which I will be sharing as soon as I get an audio sample of my synthesized voice. But last Monday night I was the Voice of God (VOG) for an awards show at the massive, elegant and ornate Cipriani’s on 42nd Street, across from Grand Central Station, in New York City. VOG, or live announcing is a whole beast unto itself…You have to be on your toes, ready for whatever unexpected kink in the works happens so that you communicate — to the gathered 1,000+ guests — with authority and elegance what’s happening now and about to happen soon. 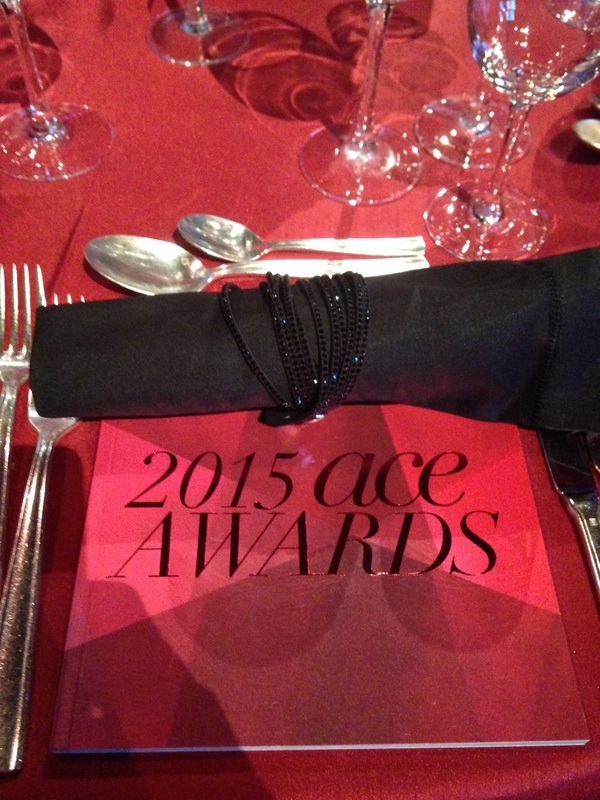 The event was for the Accessories Council ACE Awards, with presenters like Paula Zahn, Carolina Herrera and Taraji P. Henson (from the show Empire), honorees Ivanka Trump and John Varvatos, and sponsors like Swarovski and Bulgari. Thanks to the amazing work of Chris Herrmann at Mannic Media, the show went flawlessly — no easy task given the behind the scenes monkey wrenches that cropped up: guests presenters and honorees refusing to wait in the wings so they approached the stage from their tables, which took much longer than we had time for, plus wardrobe malfunctions and timing concerns around when food was being served vs. where we were in the program of events. At the suggestion of the world famous Randy Thomas (who voices the Oscars and every other top award ceremony event), I brought my Sennheiser 416 mic to the rehearsal earlier in the afternoon to potentially improve on the mic that was being provided. But for technical reasons, (mainly an on/off switch on the mic they provided), their mic gave us more control over the exact timing of the mic being live for the announcements, so my 416 wasn’t used, but I was glad to have offered its services.